Italians rarely use pumpkin for desserts, but it is frequently eaten as a vegetable in winter months. Canned pumpkin can be found in expensive import shops for about $5-8 per can, but pumpkin is readily available by the slice. Supermarkets have sliced pumpkin wrapped in plastic in the produce section. In vegetable markets, you can usually get the stall keepers to slice off a chunk of pumpkin with you choosing the width of the slice. I find pumpkin somewhat difficult to peel, so I usually pop it into the microwave for a couple of minutes before carving out the pieces. If I want pumpkin puree for something like gnocchi or noodles, I nuke it for about fifteen minutes, making sure to have it in a bowl to catch the liquid it exudes. Then I scoop out the pulp and set it in a strainer for about half an hour for the additional water to drain, then puree it in a blender or food processor. If you want to use your Halloween pumpkin, or part of it, you can also cook it in the oven for thirty to 40 minutes, again making sure it in a pan with deep sides to collect the excess water. Otherwise, you’ll flood your oven. This fresh pumpkin puree tastes stronger and fresher than the canned variety. Substitute two cups of fresh puree for a one-pound can of pumpkin. Cubed pumpkin sauted in olive oil with garlic and rosemary makes a welcome autumn side dish. Sometimes it’s cooked with olives or onions, often paired with rosemary. Soups based on pumpkin come in many forms. Sometimes with chick peas or with spinach. Other times it’s cooked with onions and small pasta shapes. 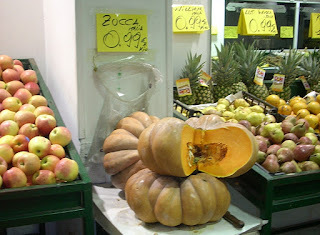 You can also find many different types of risotto using pumpkin. I love gnocchi, little dumplings, made with pumpkin instead of potato and topped with a gorgonzola sauce. But pumpkin reigns in pasta dishes. It’s often a filling for ravioli or tortellini and other stuffed pastas. It can be used to make pasta dough and cut into tagliatelle or fettuccini. Pasta flavored this way can take a delicate butter and parmesan sauce or a stronger sauce made with sausage. 2. Cook the lasagna noodles in a large pot of lightly salted water until just barely al dente. Drain and stretch out on a clean kitchen towel to drain excess water. 3. Mix the pumpkin pulp with 1/2 cup of the parmesan, cream, salt and pepper, and a grating of nutmeg. 4. Butter a baking dish, and lay down one strip of lasagna. Spread on some of the pumpkin mixture, a layer of Fontina slices, and sprinkle on some of the remaining parmesan. 5. Continue assembling these layers until all the ingredients have been used. 6. Place the lasagna in the oven and bake for twenty minutes. 7. Remove it from the oven and allow it to rest for a few minutes before serving. 8. Serve with extra parmesan, if desired. So it's early morning here, and I don't like cooked pumpkin. Or I didn't until I read your blog this morning. Now I'm copying your recipe. And planning a pumpkin garden for next year. YUM! Do try the pumpkin sauted with garlic and rosemary. I think you could use those mini pumpkins for that without having to buy a whole pumpkin. Popping in to say hello! I love your recipe. I'm thinking to try it for Thanksgiving with our extended family. Wishing you all the best. Maggie, thanks. Once in the U.S. I did a Thanksgiving for friends using all Italian recipes with traditional food. Pumpkin ravioli, turkey breast slices stuffed with prosciutto and spinach, etc. It was great fun. I meant to say traditional Thanksgiving food. Oh, my, can't you just come and cook for me? It all sounds so good. Maybe I'll get brave and try the lasagne recipe. Have you thought of writing a cookbook? An American in Rome sort of thing? I'd buy it. Actually, I do have that in mind. Oh Ren. That sounds delicious. I'm going to try it immediately. That's a nice ratio of onion to pumpkin. And penne rigate is my favorite pasta.